SAN JUAN, Puerto Rico (AP) — The head of Puerto Rico’s power company said Sunday the agency will cancel its $300 million contract with Whitefish Energy Holdings amid increased scrutiny of the tiny Montana company’s role in restoring the island’s power system following Hurricane Maria. The announcement by Ricardo Ramos came hours after Gov. Ricardo Rossello urged the company to scrap the deal. Ramos said that Whitefish will continue with current work, but the contract would then be scrapped — leading to delay of 10 to 12 weeks in completing the work. Federal investigators have been trying to investigate the contract awarded to the small company from Interior Secretary Ryan Zinke’s hometown and the deal, signed shortly before the hurricane hit, is being audited at the local and federal level. Whitefish spokesman Chris Chiames told The Associated Press before the Ramos announcement that the company would soon issue comment. Rossello said earlier that nearly $8 million has been paid to Whitefish so far. Rossello said he has requested that crews from New York and Florida come help restore power in Puerto Rico as he criticized the U.S. Army Corps of Engineers for not meeting its goals. The agency could not be immediately reached for comment. The governor also announced the appointment of an outside coordinator to oversee the power company’s purchase and contracting division. “If something illegal was done, once again, the officials involved in that process will feel the full weight of the law, and I will take administrative actions,” Rossello said. Roughly 70 percent of the island remains without power more than a month after Hurricane Maria struck the U.S. territory on Sept. 20 as a Category 4 storm with winds of up to 154 mph (245 kph). Ramos has said that Puerto Rico’s Electric Power Authority reached a deal with Whitefish just days before the hurricane struck, saying that he spoke with at least five other companies that demanded similar rates, in addition to a down payment the agency did not have. Ramos also has said the Federal Emergency Management Agency had approved of the deal, something the agency has denied. FEMA has raised concerns about how Whitefish got the deal and whether the contracted prices were reasonable. The 2-year-old company had just two full-time employees when the storm hit, but it has since hired more than 300 workers. A Whitefish contract obtained by The Associated Press found that the deal included $20,277 an hour for a heavy lift Chinook helicopter, $650 an hour for a large crane truck, $322 an hour for a foreman of a power line crew, $319 an hour for a journeyman lineman and $286 an hour for a mechanic. Each worker also gets a daily allowance of $80 for food, $332 for a hotel room and $1,000 for each flight to or from the mainland. Whitefish Energy Holdings is based in Whitefish, Montana. Zinke, a former Montana congressman, knows Whitefish CEO Andy Techmanski, and Zinke’s son also had a summer job at a Whitefish construction site. Democrats also have questioned the role of HBC Investments, a key financial backer of Whitefish Energy. The Dallas-based company’s founder and general partner, Joe Colonnetta, has contributed thousands of dollars to Trump and other Republicans. Chiames has said Colonnetta’s political donations were “irrelevant” and that the company would cooperate with any federal authorities. This week, Rep. Rob Bishop, the Utah Republican who heads the House Natural Resources Committee, sent the power company director a letter demanding documents, including those related to the contract with Whitefish and others that show what authority the agency has to deviate from normal contracting processes. 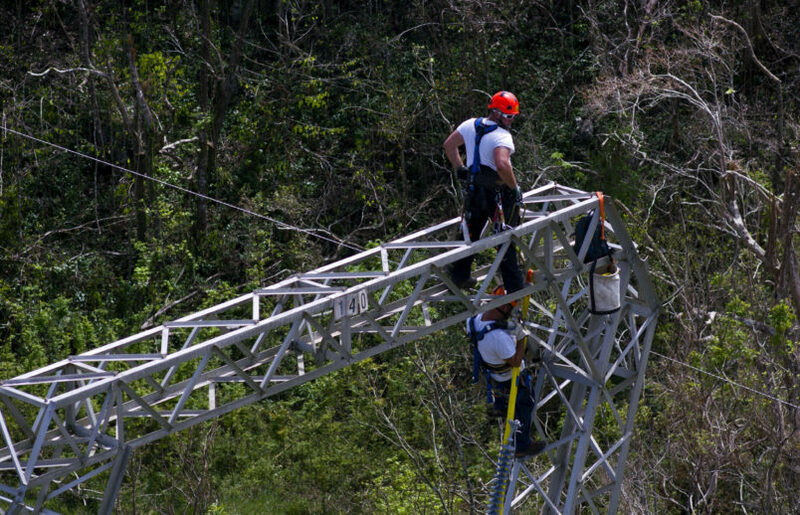 “Transparent accountability at (the power company) is necessary for an effective and sustained recovery in Puerto Rico,” his office said in a statement. A federal control board that oversees Puerto Rico’s finances announced this week that retired Air Force Col. Noel Zamot will be in charge of power reconstruction efforts. Rossello and other officials have rejected the appointment, saying the local government is in charge of a power company that is $9 billion in debt and that had struggled with ongoing outages before hurricanes Irma and Maria hit last month.